How many shades of green can there be? Oh, my goodness! We have all heard of the Emerald Isle, right? I've heard that for years. Little did I know how really green the island of Ireland really is. The contrasts in value, tone, and tint of the color green can be eye-popping. The landscape is a patchwork quilt and every quilt you see in the landscape has a polka-dot fabric with a green background and cream dots, the dots being sheep. So many sheep in so little space and time! If the dots have a bit of black in them, that is probably dairy cattle. Bobby and I had two wonderfully informative and pleasurable weeks of learning about the Republic of Ireland and Northern Ireland. We visited the cities and the villages. We visited family-run farms and crowded pubs. We saw pre-historic sites and modern cities. We learned of a very smart guy who leased a section of Dublin for 9000 years - even saw the lease papers that were signed by all parties. Talk about locking in your options! The rent never goes up. That 9000 years is not a typo - Arthur Guinness contracted for that many years. What a great trip this was for us and we are grateful to the employees at Heirlooms & Comforts for filling in for us to be away for that time. Just watch out now for Bobby; he kissed the Blarney Stone so who knows what kind of verbal attitude he will exhibit now that he should never again be at a loss for words. At Heirlooms & Comforts this week we will feature Clean Off the Bolt all week long. You will get a 25% discount on any regular price fabric when you take everything left on the bolt-1yd or 18yds. If you take all that is remaining on a sale price bolt you will get an additional 10% off the current discount-if it is marked 30% off you will get 40% off when you take it all. There are some really skinny bolts on the shelves. You could get a real bargain on that piece you have been eyeing. At Heirlooms & Comforts we will be closed on Saturday, September 3 and Monday, September 5 in observance of the national holiday of Labor Day. We will reopen on September 6 at regular time. Watch carefully this fall for special store hours with regards to Clemson University home football games. We will announce each week when we have home games what our Saturday hours will be for those weeks - it will depend upon the starting time for the games. This will be subjective, selective, arbitrary store hours to accommodate the situation. Announcements will appear in the weekly e-mail and on signage in the shop. Heads up. The Stuffits Doll Club, which originated at Heirlooms & Comforts years ago, will have a show at the Pickens County Museum from September 10 to November 10. The members of this club are incredible artists in the world of dolls. They create the most wonderful dolls that illustrate so many different ideas, stories, techniques, fantasies, and customs. You have missed a real joy if you have never seen one of their shows. How could people have such great imaginations and talent all in the same being? The skill with which they create these dolls is awe-inspiring. Make time to go to Pickens to see this show. Pick up announcement cards at H&C detailing the show times. You know, if you can keep your health and your good disposition you can last a long time. When I think about how long I have lasted compared to some people I know about, I have a number of years to keep going. My grandfather lived to be 92 years old. My dear mother lived to be 89 years old, saying the entire last decade that nobody in her genetic pool that she knew of had lived that long. I see businesses celebrating 50 or 60 years in business and think how great that is. Now, I know that no one person solely managed one business that long; there had to be more than one who was "in charge" for at least 20-30 years of that time. Don't you think? Those couples I see in the paper that have been married for 50 or 60 years have me in awe, until I think about Bobby and me celebrating 47 years of marriage. Shoot, our oldest offspring is 42 years old. Come September 24, Heirlooms & Comforts will be 27 years old. Whoo, whoo! We are still at it. And that is partly due to the great customer base that we have. You make life interesting for us at Heirlooms & Comforts. Your support is appreciated. At Heirlooms & Comforts this week we will feature rulers. We have quite an array of rulers that are both utility tools and specialty tools. This week your choice of rulers will be 20% off. Look at the quilts you want to make to see if special rulers are needed and then come in for a special price this week. Don't forget! 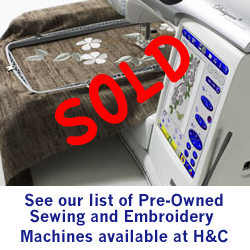 At Heirlooms & Comforts we usually have a number of pre-owned machines available for adoption. You can find a list on our web site of machines that have been traded in for new models. Check it out if you need a second machine for classes or to sew on while you also have an embroidery machine running. Or if you don't already have a machine we can "fit" you with one. See us for options. Do you know what an Auto-writer is? Nor do I. But I thought it is a good name for when I write this email ahead of time since I am unable to write a fresh email this week. This will be very brief and if you have question about any of the information, you can get answers by calling in to Heirlooms & Comforts and asking the girls about what is going on. It is all fun and everyone needs a little fun in their lives. It gets you smiling and a happy face will make others happy as well. At Heirlooms & Comforts this week we will feature machine needles. Buy three packs and get the fourth one free. The fourth package should be of equal or lesser value. Choose any type of machine needles: universal, stretch, micro-tex, etc. Good needles help produce good finished products and make the sewing machine run smoothly. Stock up now! Cissie is getting the class schedule together to be published near the end of August. If you have a request for a particular class or type of class, call the shop to let Cissie know what you wish to learn so that she can arrange with the teachers to get it scheduled if possible. Do this early so that she can work her magic. Have you thought that it is as hot as can be lately? Well, I think that we have been lucky that it is not as hot as it has been in some parts of the country, some of them at more than 100 degrees for 30+ days in a row. I am not asking for that, believe me! I am grateful for not having to live in that. We in the south have been made accustomed to living in air conditioning, thank goodness. People who are not equipped for the blazing hot summers are really suffering. I heard of one family who moved all the mattresses to the largest open room in the house and everyone is sleeping on the floor to catch a cross ventilation. I am thankful that I can pay a power bill and be cooled to less stressful temperatures. I can even do my sewing while I am being cooled. Are you taking advantage of being inside to do some of your sewing? We have gotten a number of holiday fabrics in so that you can begin your gift making and holiday decorating while you are closed in. Come by to check out what is here. We are coolly waiting for you. 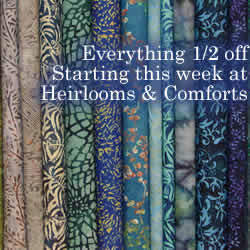 At Heirlooms & Comforts this week we are featuring thread for sewing and quilting. Buy four spools of thread (any brand) and get the fifth spool of equal or lesser value free. That means you can have all one color or five colors. Some cotton and some polyester, or not. Your choice counts. Mettler or YLI. Gutterman or Robison Anton. Konfetti or WonderFil. Remember that good thread helps to create a good quilt or sewing project. In the name of Progress, and it is progress, we will be affected by the upgrade of the sidewalks in the Town of Central very soon. We are going to be the happy recipients of new curbing and sidewalks and streetscape on our side of the railroad tracks very soon. You will have to watch for how to approach the shop and how to carefully enter the shop as the crews are taking up sidewalk materials and putting down new sidewalk construction. We will get curbs and crosswalks and more marked parking all down Madden Bridge Road to the Central Roller Mill. Hopefully this will move along very smoothly and we won't be disrupted for a long time. Watch Out!! A New Stop Sign is going in at Madden Bridge Rd. and Bank St. This will make driving safer and easier at our corner. Don't stay away during this time; just come with a cautious eye for entering the shop.